If you’ve read any of the other Miss Fortune Mystery books (US link/ UK link) then you’ll have come to expect a great story, wrapped in a chaotic bow of mishaps, held together by mystery, decorated with a little romance and presented with some serious laugh out loud moments. Hurricane Force doesn’t disappoint. 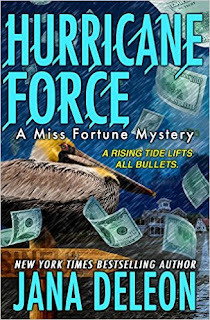 Once again, Fortune Redding, a CIA undercover operator in hiding, along with Ida Belle and Gertie, her two, Southern belle, retired accomplices are on the case when counterfeit money blows into Sinful, Louisiana on the back of a hurricane. The money is linked back to Ahmed, the arms dealer who issued the order on Fortune’s life and sent her into hiding, but someone they know and thought they could trust must be the counterfeiter. On top of it all, Ahmed’s men are in town and Fortune is in some serious danger. With the helps or perhaps hindrance of Gertie and Ida Belle, Fortune investigates the unidentified forger, all the while trying to keep the townsfolk of Sinful and her friends, safe from harm. Carter LeBlanc, the straight laced, hunky cop who has moved back to Sinful to live a quiet life, and is Fortune’s new love interest, gets involved. All along he’s accepted their weak lies and cover-ups. He was even prepared to overlook the explanation for the broken toilet in his office, but can he accept the ultimate betrayal when he finds out her true identity? Jana De Leon, a New York Times bestselling author, who grew up in southwest Louisiana Bayou has first-hand knowledge of the swamps, the wildlife and small towns where you would think nothing much happens. She manages to bring the characters (and boy, are they colourful) and side-splitting escapade to life in this light-hearted mystery. If you'd like to submit a guest review, contact me through the message form.